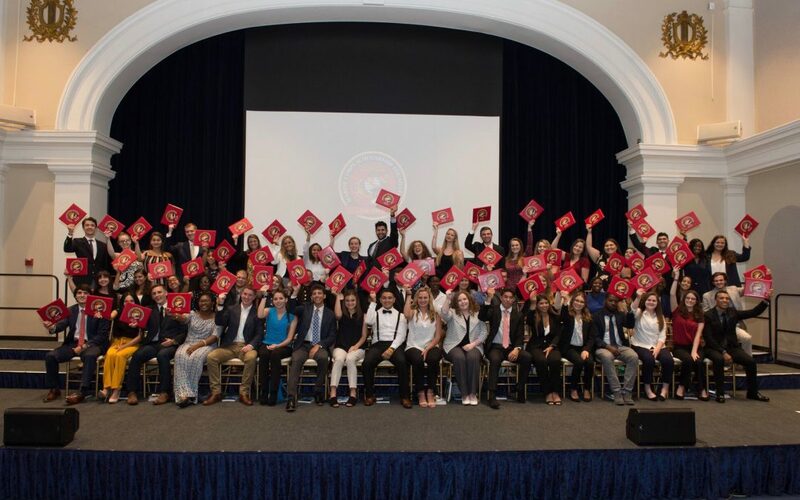 Scholarship recipients at the Marine Corps Scholarship Foundation’s 2018 announcement ceremony at the Marine Barracks in Washington D.C. (Courtesy of the Marine Corps Scholarship Foundation). WASHINGTON – The son of a fallen Marine, whose grief-stricken face became an iconic image of the war in Iraq in 2007, was presented with a scholarship Wednesday, along with more than 2,330 other young people whose parents served in the Marine Corps or Navy. In total, the Marine Corps Scholarship Foundation awarded $7.7 million in scholarships for college or technical education programs. Scholarship recipients come from all over the country and attend more than 900 different colleges and technical schools. The average cost of attending two- and four-year colleges and universities rose 65 percent over the last 20 years, according to the Department of Education. When Staff Sgt. Marcus A. Golczynski was killed in action in Iraq in 2007, his wife, Heather, said she couldn’t imagine how she would raise their son Christian alone. Christian was 8 years old when Lt. Col. Ric Thompson presented him with the flag that had been on his father’s casket at the funeral. His expression of grief was captured in a photo that soon became a well-known symbol of the cost of the war. Eleven years later, the little boy in the photo is now dating, playing football and lacrosse, and pursuing a degree at the University of Alabama, his mother said. On Wednesday, he received his third scholarship from the foundation, which he will use toward a degree in Management Information Systems. The mother and son live in Crofton, Maryland, and Heather said she could not have afforded to send Christian to an out-of-state college without the foundation’s financial support. Since its creation, the Marine Corps Scholarship Foundation has provided more than 40,000 scholarships, valued at nearly $125 million, and the group claims the mantle of the top provider of need-based scholarships for military children.